Are we all just food-selecting zombies? It was a Saturday afternoon- I spent all morning writing one of my dissertation articles. It was unfortunate that i had to be on campus instead of enjoying my morning coffee at home, but some syncing error got me panicking as I couldn’t find my latest saved draft.. So here I was with only 25 minutes before my aerial fitness class: I made a quick stop at an empty campus store, grabbed something to eat and rushed out to my car, still deeply pensive over some changes I should make- I am writing about lay interpretations of healthy eating context. OK, it made sense. Considering the context. And then I thought- I just spent 4 hours writing up my article on healthful eating beliefs.. how would I go about finding out what rationale was behind my food selection right now? Wow, that’s a whole lot of rationale for an “auto-pilot” choice that took 20 seconds without conscious effort. Of course, eating perceptions and choices are my research topic, so I am quick to self-reflect in detail. Yet for many respondents, who hold their own complex mental models of healthy eating, this can be like pulling teeth- it’s not easy to explain things that seem obvious or natural to us (unless maybe you’re writing a dissertation on it). My reasons are good examples of cognitive heuristics- “rules of thumb” used to make choices in complex situations, such as eating (we make about 200 eating decisions daily, according to Dr. Wansink- too lazy to give you the specific study name.. just google it 🙂 ) The “Protein- satiety- good” connection is a simple heuristic, the “power” and “energy” words on the bar signaled appropriateness of this snack before a workout, the familiarity of the products (I know this bar and it’s taste; bought it before) also played a role. But anyway: I’m almost done writing my first chapter now. I’m in the process of shortening it actually……… by about 10,000 words :S It’s such a painful process to let go of your findings- perhaps I’ll post a bunch of interesting results here in the coming months! I could be sporadically posting cool quotes on twitter or Instagram too, but honestly- that’d get attention of maybe 10 people. Meanwhile my latest quick sketch of a friend pulling off an aerial trick just got more than 1000 likes… So forcing myself to tweet the dissertation is lacking in motivation at the moment. In the meantime- enjoy whatever it is you might be eating right now! Don’t overanalyze it, I suppose? The protein bar’s serving size says “1 COOKIE”. Cookie! Kit Kat has the decency to refer to itself as 1 package 😀 Surely, both are just candies. At least if you consider the energy content and, really, majority of ingredients (i will admit- “monk fruit” sounds mysteriously awesome, though it is the last ingredient (so there’s like a trace amount of it). Now, obviously there’s a difference- and that’s the difference that drives the high price point of the protein bar (as well as it’s healthiness message): the power bar has more protein (13 g vs. 3) and less sugars (5g vs 21g). On another hand, the power bar has a bit more saturated fat and cholesterol. That last point is most likely less relevant to an average reader- so far, my interviews and surveys show people vilify sugar much more than fat (again, you’re probably not shocked and i’m definitely not the first one to notice- the low fat fad is over, it’s been all about the horror of carbs for awhile). Most of my present acquaintances are unaware that I used to be a huge proponent of raw foodism. “Huge” meaning I spent hundreds (thousands, actually) of $$ traveling to get certified as a chef and an educator (centers in Chicago, Atlanta, and northern California), taught “cooking” classes at the local co-op, was a private chef for months, etc. 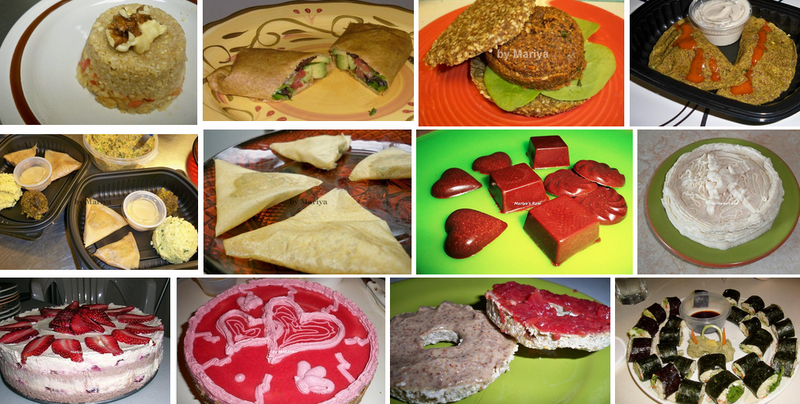 In fact, check out some of the raw vegan dishes I used to make! Is this amazing or what? I’m still quite proud of my raw culinary past. The recipes used soaked nuts, dried fruits, sprouted items (like buckwheat) and of course lots of vegetables and fruits. While fun & unique, it was also very time-consuming, rather expensive, and not necessarily healthier. It did fit well with people who have allergies (since raw recipes don’t use soy, wheat, peanuts or many other problematic foods). I almost spend all day writing down why exactly I have concluded raw veganism is unnecessary and based on false beliefs… But that would be a true waste of time (and rather dull to me) so I’d rather redirect you to already well-written articles! False belief 1: We are meant to be plant-based because our physiology shows we’re herbivores! Another thing worth mentioning is the incorrect assumption that vegetarian/vegan folks are healthier than others because they avoid meat. Majority of big studies I went through in my nutritional epidemiology class compared meat-avoiders with people on a standard american diet…and didn’t do a good job controlling for the fact that they compared health-conscious vegetarians with generally regular unhealthy folks. Luckily i don’t have to write more, because THIS ARTICLE did it for me AND gave citations (woohoo!). Pay attention that health benefits of meat-eaters is more correctly attributed to other healthy behaviors (avoiding refined sugar and grains, oils and trans fats, avoiding smoking and so on). False belief 2: Cooking is unnatural. First of all, let me point out that some types of cooking of some foods produce potentially carcinogenic compounds. HERE is my post on acrylamides. Like with other valuable claims from raw foodists- this is not supposed to mean you should never eat baked potatoes. It means having antioxidants in your diet from other plants is very important. The new genetically modified potato, by the way is designed to decrease acrylamide content. Unfortunately, generalized anti-GMO sentiments might win over that benefit. How Cooking Made Us Human Read this wonderful New York times article on the Catching Fire book and how cooking was instrumental in our evolution! I remember I was aghast when i heard of this book- you mean turning food into murderous evil toxic stuff that kills cute kittens made us human?? I’m clearly joking here, but not actually over-exaggerating too much. Many of us in the raw community would absolutely avoid the healthiest of soups, since cooked was equivalent to “toxic” and “addictive” in our heads. Humans are adapted to controlling fire & using it to cook. See part of the “Human adaptation to the control of fire” paper here (click on pics to enlarge). For full paper, here is the citation but it might not be free unless you have university affiliation- Wrangham, R., & Carmody, R. (2010). Human adaptation to the control of fire.Evolutionary Anthropology: Issues, News, and Reviews, 19(5), 187-199. TRY HERE. 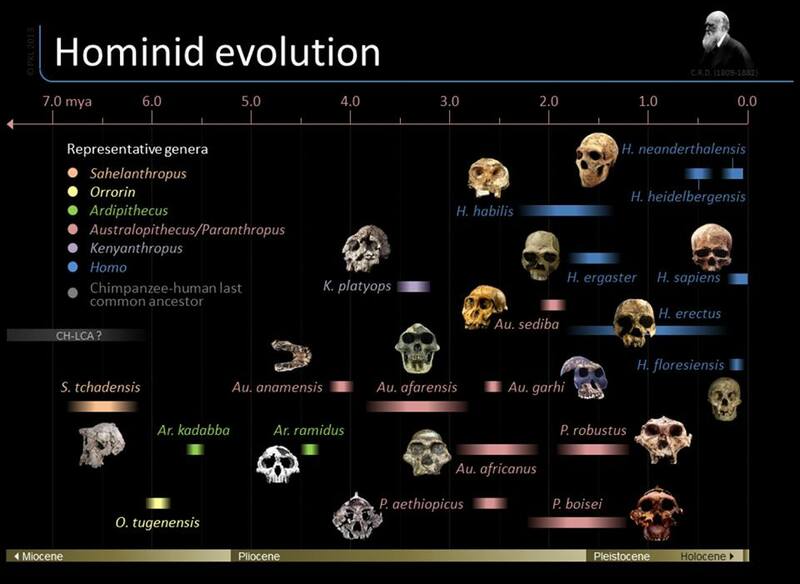 No- fire was controlled prior to emergence of homo sapiens. 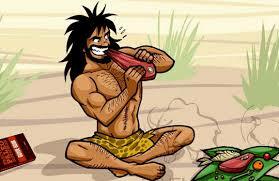 In fact, the earliest convincing evidence of fire use for cooking appears the 780,000-400,000 years ago. Animals show that anatomy can adapt very quickly to a change in diet. With human populations that have a history of dairying (like northern Europe), ability to digest lactose into adulthood has evolved at least twice in the last 7000 years. For people with a recent history of eating starch-rich foods, they exhibit higher copy numbers of the gene encoding for a certain enzyme. *cricket sounds*……….. What is this supposed to argue? There is no way to discredit a completely illogical statement. Real point here: humans are adapted to cooked diets. Reductions in masticatory and gastrointestinal anatomy show that. See Wrangham article cited earlier. This does not necessitate eating a raw vegan diet though– it necessitates being reasonable and, like recommended by parents, governments, and nutritionists, make sure to eat your fruits & vegetables and minimize high-caloric processed foods. This also doesn’t mean eliminating animal foods at all. 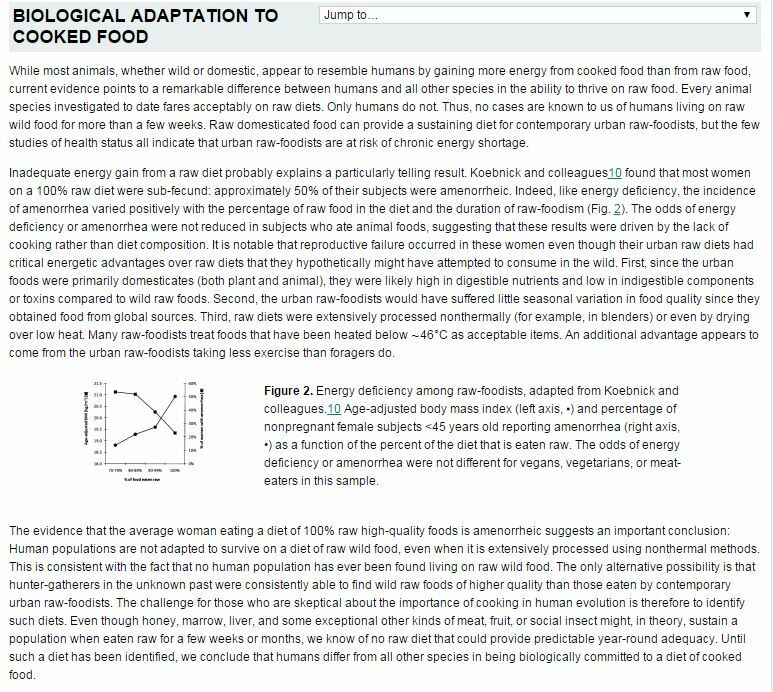 Here is a great article*** that estimates the “acid load” of diets of hunter-gatherers (HG) and modern diets. They find the HG diets were neutral (e.g. not “too acidic”, if you prefer) and contribute elevated diet acidity of modern diets to processed cereal grains. Great idea to minimize on processed products anyway! *Deng, G., & Cassileth, B. (2013). Complementary or alternative medicine in cancer care [mdash] myths and realities. Nature Reviews Clinical Oncology,10(11), 656-664. ** Pizzorno, J., Frassetto, L. A., & Katzinger, J. (2010). Diet-induced acidosis: is it real and clinically relevant?. British journal of nutrition, 103(08), 1185-1194. *** Sebastian, A., Frassetto, L. A., Sellmeyer, D. E., Merriam, R. L., & Morris, R. C. (2002). 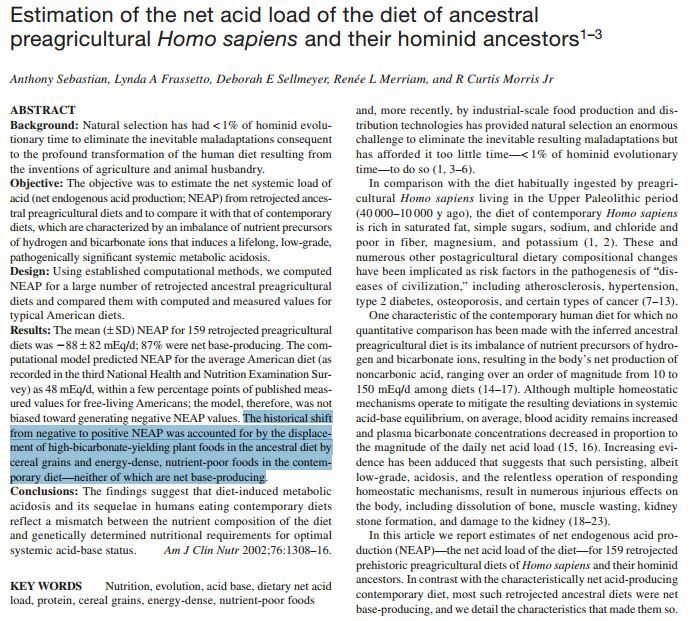 Estimation of the net acid load of the diet of ancestral preagricultural Homo sapiens and their hominid ancestors. The American journal of clinical nutrition, 76(6), 1308-1316. There’s no scientific support for this, and that’s about it. **** In fact, this was my turning point in adhering to this lifestyle: I realized this very foundational claim has no basis. The evidence raw proponents cite is a 1985 book called Enzyme Nutrition. That’s 30 years ago… good science is self-replicating so I would expect there to be more studies on such a potentially fascinating subject if there is something to it.. I don’t see any. **** Hobbs, S. H. (2005). Attitudes, practices, and beliefs of individuals consuming a raw foods diet. Explore: The Journal of Science and Healing, 1(4), 272-277. None of this is supposed to go against the fact that eating a lot of fresh fruits and vegetables is very important and very healthy! HERE is a nice Scientific American article giving examples when some vegetables are better and worse when cooked. But this is supposed to discourage you from forming a belief system that humans aren’t “supposed” to eat cooked and animal-based food***** or that there is a need to stick to eating raw plants only. It is also supposed to prevent damaging thinking- e.g. a hot chicken soup is toxic; cooked food is addictive; non-organic food is dangerous. Humans have a tendency towards monotonic thinking- it’s hard for us to be OK with the fact that something we consider “bad” is only bad at high doses and is actually essential and beneficial at lower doses (e.g. fat, salt in the diet for some people). Considering this lifestyle takes a lot of time and effort, does not necessarily results in weight-loss (and when it does- it’s just because you eat less calories, not because raw food is magical.. if you go heavy on the nuts & oils you will gain wait), and there is absolutely no reason to consider this eating natural or superior I believe this dietary approach is unnecessary and attempting to stick to a highly raw food diet results in a lot of stress for no reason. Note:I am intrigued by the possibility that this approach might have therapeutic benefits. It’s not based on any present science, folks, but I would be excited to see studies of this eating plan as a medicinal diet for improvement of certain conditions!! ***** As a good friend of mine noted- it’s important to remember that vegetarianism/veganism is not only a choice to be healthy..but it’s also a choice due to environmental and ethical concerns. I’m unqualified to cover those in detail, but it is obviously an important reason some people avoid animal products and I’m not arguing against it!